A key function of Wall Street is to bring promising new companies to market to ensure that the U.S. remains competitive in new industries and good jobs and innovation. This process is called Initial Public Offerings or IPOs. 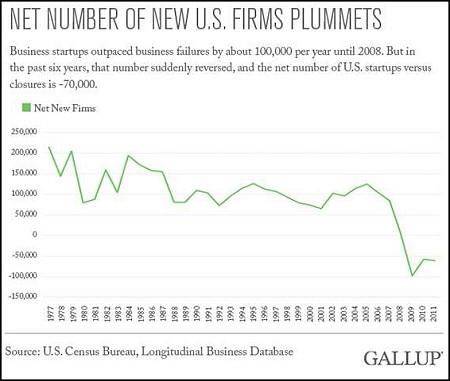 But the nation was put on notice as far back as 2001 that Wall Street was more snake oil salesman than the locomotive for new business launches. The largest investment banks were calling the startups they were peddling to the public on the Nasdaq stock market “dogs” and “crap” behind closed doors while lauding their virtues in publicly released “research” announcements. At the time Chernow wrote those words, $4 trillion had been erased from the markets. At Nasdaq’s peak, set on March 10, 2000, it was at 5,048.62. Yesterday, the Nasdaq closed at 4,771.76. Our job creation engine has sputtered and backfired for a decade and a half without intervention from Congress or the White House. Wall Street investment banks are still allowed to write research reports on the same companies they are bringing to market despite the $4 trillion lesson that this is a flawed, corrupt system. Just seven years after the Nasdaq crash, Wall Street collapsed the entire U.S. financial system and the nation’s economy. We are now entering the second leg of that economic collapse as deflation takes root in major industrialized nations around the globe, supply gluts proliferate on weak demand, and oil and industrial commodity prices collapse. Wall Street looked around for other suckers to fleece – public school districts, towns, counties, cities and states. It knew that it was only a matter of time before its massive issuance of mortgages to people who could not afford them would blow up the housing market and create a long-term downturn, bringing rates to record lows, so it sold tens of billions of dollars of interest rate swaps to these public entities. The public entities would receive a variable rate tied to Libor; Wall Street would receive a higher, fixed rate. Wall Street then proceeded to engage in a conspiracy to rig the Libor interest rate to its advantage. Typically, the public entity ended up receiving a fraction of one percent in interest, while contractually bound to pay Wall Street firms as much as 3 to 6 percent in a fixed rate for twenty years or longer. To get out of the deals, public entities have been forced to pay Wall Street tens of billions of dollars in termination fees, further fleecing the public purse. Wall Street’s overarching function today is that of an institutionalized wealth transfer mechanism, propped up by compromised regulators and a dysfunctional Congress. As the PBS program Frontline reported in 2013, if your work career spans 50 years and you receive the historic return of 7 percent on stocks in your 401(k) plan, the 2 percent typical fee charged by Wall Street mutual funds will gobble up almost two-thirds of your account.